The new MONARCH 3000 STABILIZED is the latest example of Nikon changing the game with its innovative rangefinder technology. With an effective range of nearly 2 miles (3,000 yards) on reflective targets, we’ve tripled the ranging capability compared to our award-winning, image-stabilized laser rangefinder introduced last year. For 2018, we’ve also added an all-new variable intensity red OLED display that provides either automatic or five selectable brightness levels for maximum contrast against most targets and backgrounds in virtually all lighting conditions. For incline or decline shooting angles, the MONARCH 3000 STABILIZED is equipped with Nikon’s ID Technology that takes the angle out of the equation. 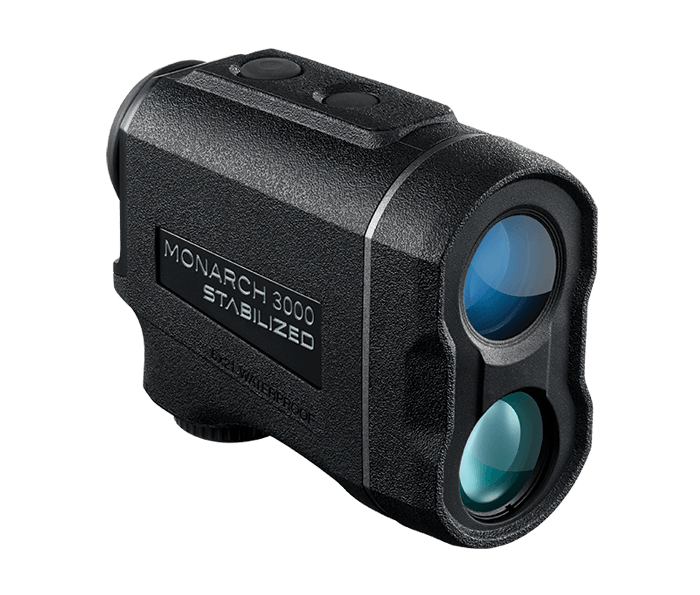 Designed for single-handed operation, the MONARCH 3000 STABILIZED instantly stabilizes the image you see in the 6x monocular and simultaneously activates the HYPER READ function within for extraordinarily fast, positive measurements. Employing Nikon’s STABILIZED system, vibrations of the image in the viewfinder caused by wind, adrenaline, cold and other hand movements are reduced*, and the irradiated laser is also aligned at the same time. Because you can direct the laser onto the target faster and more easily, the ease of measurement to a small target is greatly improved; all achieved by Nikon’s original technologies that are a fusion of vibration reduction and high-performance measurement function. * The effect of vibration reduction: Vibrations of the image in the viewfinder caused by hand movement (sinusoidal waves) are reduced to approx. 1/5 or less (Based on Nikon’s measurement standards). Nikon’s advanced ID Technology provides the horizontal distance to the target, even when ranging at various incline or decline shooting angles – up to an incredible +/- 89 degrees (nearly vertical up or down). Wide field of view, long eye relief and bright optics get you on target faster and allow you to see more. Made to withstand even the worst conditions, the MONARCH 3000 STABILIZED is waterproof and fogproof.